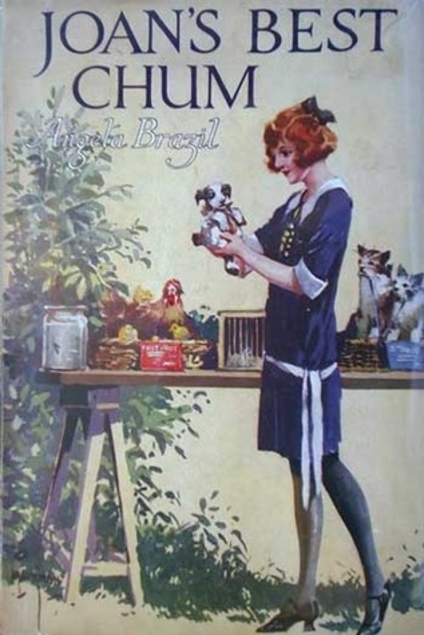 Joan’s Best Chum by Angela Brazil was first published way back in 1926 although my copy has that Book Production War Economy Standard logo on it. The main characters in this book have all been more or less abandoned by the adults in their lives, albeit not by choice as Joan’s parents are dead and Ursula her older sister has taken on the job of bringing Joan and Rex their brother up, supposedly aided by Uncle Robert who is a local solicitor and turns out to be of no help at all. Ursula realises that if she wants to train as a secretary she will have to ask Ursula to stay at her school as a boarder, rather than a day girl as she is now. Rex has just begun to train in Uncle Robert’s firm of solicitors. When Mollie ends up joining Allandale School as a boarder too she becomes firm friends with Joan, they have lots in common. Mollie’s mother is dead and her father seems only interested in visiting casinos abroad so he might as well be dead for all the interest he takes in Mollie. This book is about young women who fight to maintain their dignity and independence in very difficult circumstances which are made worse by the actions of a duplicitous man. It’s interesting because it isn’t all set in the school environment and is a bit of an advert for the YWCA and the YMCA which I was surprised to learn had first been set up way back in 1855 in London for the women and 1844 for men. I’ve only read a few of Angela Brazil’s books but it seems that she was keen to show lots of aspects of life outside what would be the rather rarefied atmosphere of many boarding schools. This entry was posted in Books and tagged Angela Brazil, boarding school story, Joan's Best Chum by Katrina. Bookmark the permalink. Love the title of this book! I was quite surprised to find that Joan’s friend was called Mollie, not Katrina or at least Katherine! I guess the book was a bit before our time! In my experience, the name ‘Joan’ fell out of popularity in the 1950s. I can’t think of anyone much younger named Joan. You’re right, I think you must be the youngest Joan I’ve ever heard of. I find names so interesting and never thought that names like Harriet, Molly or Sophie would become popular again, but they have. I await the resurgence of Joan! I’ve never read any of Angela Brazil’s books, but this one sounds interesting. I enjoy stories about young women breaking bounds – as long as they don’t suffer too much in the process, and I do prefer that they prevail! I think that books like this were really necessary as so many young women who would have expected to get married and have a family couldn’t as so many men had died in World War 1. They had to rely on themselves to make a good future and be independent through work – something very new, certainly to the more middle class young women.